Figure 10. Global net primary productivity increase as of 2010. The phenomenon of planetary greening has continued unabated since then. Source: CSIRO Australia. “Deserts ‘greening’ from rising carbon dioxide: Green foliage boosted across the world’s arid regions.” Science Daily, July 8, 2013. When confronted with this reality of global greening, the typical response of environmental ideologues is to shut their eyes and cover their ears, or instead, to roll their eyes and adopt an air of condescending authority while referring to some totally imaginary scientific consensus and then affecting the hastiest possible retreat to avoid any further informed discussion. NASA has found itself in somewhat of an awkward position with the results of this study. On the one hand they are subject to pressures emanating from the Executive branch of the U.S. Government, being considered an independent agency within that branch. What might be questionable at this point in time is the genuineness of NASA’s independence. Several prominent NASA scientists have been in the forefront of promoting global warming fears and there can be no doubt that for eight years the Obama administration was pushing global warming orthodoxy as promulgated by the “Intergovernmental Panel on Climate Change − Summaries for Policymakers” and by powerful, well-funded environmental groups. On the other hand, NASA certainly deserves credit for featuring a report that introduces a critically important dimension into the debate on climate change that is not consistent with the mainstream, government-manufactured narrative – the debate that is, again, nowhere near being settled as proclaimed by those factions with political, economic or environmental agendas. All of this contrary evidence should lead one to ask: How is it that the promoters of catastrophic anthropogenic greenhouse warming (AGW) never talk about any of the research discussed in this essay? Is it because admitting a positive benefit contradicts their narrative? Is it because the evidence demonstrates that whatever may be the projected unfavorable consequences of increased atmospheric carbon dioxide, there is unequivocally an upside. I think the answer is obvious. But this idea of carbon dioxide benefits is so contrary to the official interpretation of “climate change” that all of those true-believers and promoters of AGW, heavily invested in the belief of a carbon dioxide triggered global climate catastrophe, will avoid by any means necessary the responsibility of confronting facts that do not support their doctrinal narrative. Even a modest open-minded scrutiny of mainstream and popular sources of information thoroughly confirms this evasion. However, one thing is absolutely certain. The world we live in is going to change. It has changed on all meaningful time scales which we are capable of measuring. It is going to continue to undergo a variety of changes no matter what we humans do, no matter what kind of regulations, legislation, taxes, subsidies or carbon remediation schemes are ordained by the high priests of climate change. And sometimes those changes will be catastrophic. It is also a fact that human activity is going to play a role in these changes – more pronounced in some areas and less in others. And, it is also a fact that all change requires adjustment and adaptation. This is unavoidable. The picture painted by the research discussed herein on the biological effects of enhanced CO2 shows that there is an advantage and a benefit to the increase in atmospheric concentrations whatever else may occur as a consequence of a hypothetical and uncertain temperature rise. In a realistic cost/benefit analysis one would ask whether or not, or to what extent, the positive effects counterbalance the negative effects of CO2-driven temperature increases. We can see that the intensified primary productivity of the biosphere could result in substantial gains in crop productivity, meaning more yield-per-acre, thus producing more food on less land. This would be an extremely valuable outcome, one the environmentalists should celebrate. In addition, the standing timber supply shows a powerful positive response to CO2 enrichment. The increased resiliency of plants to environmental stresses such as drought, disease, insect invasion, pollution and so on would be an outcome whose value would be immense. Drake and Gonzalez-Meler were with the Smithsonian Environmental Research Center, and Long was with the John Tabor Laboratories, The Department of Biological and Chemical Sciences at the University of Essex, U.K.
Of course, this astonishing display of positive effects must be weighed against potentially negative ones. However, it should be kept in mind that the positive effects are the result of hundreds of empirical, real world studies on the effects of carbon dioxide on vegetation. Most of the negative consequences of increasing carbon dioxide concentrations at this point are conjectural, based upon projections accruing from computer simulations and are purely hypothetical, such as, for example, the speculated rise in temperature driving an increase in storm and hurricane activity, or an increase in the intensity and duration of drought, or the rising of sea level caused by the melting of Greenland and Antarctic ice sheets. Each of these assumptions can and should be challenged and tested, not proclaimed and then insulated from all further discussion and debate. It is this effort to shut down debate, by calling anyone who questions the assumptions driving government-sponsored computer models, a “climate change denier” that demonstrates there is a fundamental dishonesty involved and a major effort to stifle alternative points of view. Let us be clear: the use of terms like “climate change denier,” “denialist” and so on in response to legitimate questions and criticisms of computer-based projections of future climate change is a certain indication that the individual employing such terms is the witting or unwitting purveyor of a fraudulent, manufactured consensus and the subjugation of science to the service of propaganda. The use of such name- calling is intended to shut down the necessity of any further discussion or debate by discrediting anyone who questions the hallowed “consensus.” But those who engage in such name-calling are, in fact, only destroying their own credibility, especially when the names so employed have no basis in reality at all outside of their uninformed and misinformed imagination. Especially is it never settled with respect to an issue as complex as climate change. The term “climate change denier” is a blatant absurdity. NO ONE denies that the climate changes. Those who throw out this term are literally proclaiming their ignorance of the subject of climate change − or worse − they are revealing their dishonesty since, they are, to a greater or lesser extent, knowledgeable of these matters, but prefer to avoid honest discussion because of a commitment to political or economic agendas. It is the purpose of this essay to inquire into the relationship between carbon dioxide and Earth’s biosphere, and her plant kingdom specifically. Seeking to answer the question of whether or not, or to what extent, the addition of trace amounts of carbon dioxide to the global atmosphere is going to trigger a catastrophic global warming, or any detectable warming at all, or something in between, is not the objective. However, in spite of IPCC projections, it now appears that the global climate is not as sensitive to increased CO2 concentrations as assumed in the early models that relied on introducing positive feedback processes to amplify the initial effect. On the other hand, as discussed above, the effect of an increase in carbon dioxide concentrations on plant primary productivity has been shown to be complemented by a modest temperature increase. This is not to say that the role of carbon dioxide in provoking a warming of the global climate is in any way to be demoted from continued study or concern. However – again – the empirical evidence of actual global temperature and the IPCC’s computerized projections continue to diverge to the point that it is fair to question the assumptions regarding the effectiveness of increased CO2 concentrations on the warming of the global climate. It is in the nature of the absorption of long-wave radiation by carbon dioxide that its capacity to capture and re-radiate heat energy is mostly accomplished by the first 100 parts-per-million atmospheric concentration, with diminishing effectiveness beyond that amount. This fact has important consequences regarding the efficacy of increased atmospheric carbon dioxide to actually provoke a significant warming of the global temperature and is a question that needs to be addressed in greater depth. This is not to say that there are not limitations on the benefits, and most likely contraindications of elevated atmospheric carbon dioxide, and these, of course, need to be addressed. Nevertheless, an honest discussion of the consequences of more carbon dioxide in the atmosphere needs to include all dimensions of the problem, and not be limited to only hypothetical negative effects. There is one more factor relative to the phenomenon of carbon cycling that needs to be addressed in regards to the matter of climate change. It is especially important to understand that the advent of our ability to technologically monitor changes in global temperature on any meaningful scale goes back barely more than a century and coincided with the termination of the Little Ice Age. The Little Ice Age was a period of global cooling that began in the early 14th century, and, with several interruptions, continued into the early and mid-19th century. Its cessation was not everywhere simultaneous – some regions warming earlier than others. It is considered by many paleo-climatologists to have included some of the coldest few centuries of the entire Holocene (the last 11 thousand years or so). The Little Ice Age was a time of worldwide expansion of glaciers with many of them growing more massive than they had been since the Great Ice Age ended at the beginning of the Holocene. The temporal and historical coincidence between the end of the Little Ice Age, the scientific ability to record and monitor temperature changes on a large scale, and the ability to measure atmospheric CO2 concentrations means that the baseline against which the degree of global warming is now being measured just happens to be one of the coldest periods of the entire Holocene. This raises a legitimate question: How much of the temperature rise since the mid-19th century is natural and how much is CO2-driven? It is typical to plot data on temperature rise during the period from mid-19th century to the present as the dependent variable, plotting the time span on the x-axis only from the end of the LIA to the present. This is going to misleadingly exaggerate the appearance of the y-axis, making the temperature increase look more dramatic than it would appear if graphed on a longer time frame. Since we have been discussing the positive consequences to vegetation and forest growth resulting from an increase in carbon dioxide concentrations and temperature, it would be valuable, by way of contrast, to look at the vegetation response to global cooling such as occurred during the Little Ice Age. It should be noted before proceeding that given the rebranding of the term “global warming” to “climate change,” as used in the title of this article, could easily be misleading. Since the phrase “climate change” has now been re-defined to mean human-driven global warming, and, unless one goes beyond the headline and reads the article, one would not know that it is actually talking about entirely natural global cooling instead. Whether the title of the article was deliberately chosen to mislead I cannot say, but the potential for such deception is certainly obvious. In any case, the work of Campbell and McAndrews points to a rather disquieting fact: Global cooling is ominously unfavorable to Earth’s vegetation. A global biomass decline of 30% is disturbing to contemplate. The real question now begging to be asked is this: What would be the comparable effects today of a global cooling similar to the Little Ice Age on the world’s croplands and agricultural systems? While one cannot quantify with certainty, there is no doubt that a 30% decrease in food crops, similar to the estimated decrease of 30% forest biomass due to the onset of the Little Ice Age cooling cycle, would result in crop failures, major food shortages and subsequent famine. How much worse this would be than a 30 percent increase in the yield of food crops resulting from enhanced warming and CO2 concentrations cannot even be gauged. If the Little Ice Age could have detectable injurious effects on northern hemisphere forests, what kind of effect would the Great Ice Age have? Several studies suggest the response was severe. In 1997 a study was published in the journal Science on vegetation response to diminished CO2 availability during the Late Pleistocene. The lead author for the 8-person team was Professor Alayne Street-Perrott, with the Tropical Paleoenvironments Research Group at the University of Wales, Swansea. Other authors worked in geology, biogeochemistry, hydrodynamics, sedimentology, geography and radiocarbon dating. [see: Street-Perrott, F. et al. (1997) Impact of Lower Atmospheric Carbon Dioxide on Tropical Mountain Ecosystems: Science, vol. 278, No. 5342 (Nov. 21) pp. 1422 – 1426] The team examined pollen from piston cores extracted from the bottom of two high-altitude lakes in East Africa. One of the things they looked at were changing carbon isotope values in organic matter. These shifts are a reflection of the kind of plants yielding the pollen that settled onto the lake bottoms. As briefly discussed earlier, there are two dominant types of plants defined by the particular way they take up carbon dioxide – the C3 and C4 plants. C3 plants constitute most of the global biomass including trees. C4 plants have apparently evolved in response to environments of low carbon dioxide availability. They have not infrequently been referred to as “weeds.” Isotopic analysis of leaf waxes and algal biomarkers were used by the team to reveal the type of plants growing in the nearby environment of the lake and hence to confer the ability to make inferences about the local climate at the time those plants were growing. In other words, many scientists and workers in relevant fields were reluctant to acknowledge the degree of change that was being documented in various environments around the world, preferring instead the comforting belief in the natural stability of ecosystems over time. Up to 1700 m below present values! 1700 meters is almost 5600 feet, more than a mile. In other words, during the coldest part of the last phase of the Great Ice Age, tree-lines on tropical mountains were depressed by as much as a mile from the present tree limit. This is an extraordinary fact, with profound implications for any conception of global change. Interestingly, As Flenley also points out, studies show that by around 8000 years ago tree-lines had migrated to a somewhat higher elevation than at present, then declined back down to present elevations about 3000 years ago. None of this is in any way characteristic of a stable climate to which this planet can be returned with the implementation of politically contrived regulatory schemes. Flenley’s declaration that “There comes a time in any subject when enough evidence accumulates for a dramatic change in orthodoxy to be appropriate” is as relevant now as it was then, for as it was in 1979 – so it is again – time for a dramatic transformation in orthodoxy. The change for which more than ample evidence has accumulated has to do with a deeper understanding of the forces of global change and the realization that change on all scales has been a dominant factor in climatology, geology, biology, and in human history. However, vested interests have intervened in the scientific process to promote an agenda in which anthropogenic forces are now seen as the prevailing driver of global change to the virtual exclusion of natural factors that have been operational on all time-scales since the world began. To bolster this agenda carbon dioxide has been portrayed as the purveyor of global doom, for carbon dioxide, being a byproduct of the energy industry that powers our emerging global civilization, provides an effective means to secure control over all aspects of society, industry, and the resources of this planet. Add to that the quasi-religious belief on the part of certain environmental factions in an imaginary scenario of a pristine, unchanging world to which balance and harmony would be restored if only the influence of humans could be eliminated and industrial progress curtailed in the name of saving the Earth. I would suggest that there are two things modern environmentalists fail to realize: First, they fail to comprehend the extent to which planet Earth has been subjected to frequent and brutal assaults as part of a larger cosmic environment – assaults that generate intense global upheavals, extreme environmental and climatological alterations, biospheric disruptions, and mass extinctions – all far-exceeding in scale and intensity anything mankind has yet visited upon the planet, and, that these catastrophic disruptions of the planetary natural order occur with alarming frequency. The second thing environmentalists fail to realize is that humankind is an integral part of the natural order, and that by creating a scientifically-advanced, technological and industrial civilization on Earth, humans are performing the precise function for which God, Gaia, or Natural Selection − take your pick − created the species homo sapiens sapiens. Severe carbon dioxide limitation in this case means 180 to 200 parts-per-million, about 1 molecule out of 10,000 less than the amount in the atmosphere at the dawn of the 20th century. Since then the atmospheric concentration of carbon dioxide has increased by about one more molecule per 10,000 molecules of air, to where it is now 4 parts out of 10,000. If the atmospheric concentration of CO2 is diminished by a mere 2 parts out of 10,000 from where it now stands, it will have extremely detrimental consequences for the biosphere. Photosynthesis of C3 plants would begin to shut down and this would have grave ramifications all the way to the top of the food chain. On the other hand, increasing the carbon dioxide content by a couple of additional molecules out of 10,000 of air provokes an almost miraculous response from the plant kingdom. In fact, plants have such a voracious appetite for carbon dioxide that, one might argue, at present atmospheric concentrations the global plant realm is actually starved of its most essential nutrient. A number of attempts have been made by global warming true-believers to discount this interpretation and all that it implies, but their efforts are proving increasingly futile against the tidal wave of new information and the overwhelming evidence unfolding in front of our eyes. Farquhar also provides an important perspective on the increase in water use efficiency. But how often do we hear this discussion in the mainstream media? I don’t recall Al Gore discussing any of this in “An Inconvenient Truth.” To the extent that it IS discussed by proponents of AGW, it is only for the purpose of discrediting and dismissing the positive benefits of carbon dioxide enhancement. Sage points out that “An outstanding feature of the origin of agriculture is that it occurred independently in distinct cultural regions around the world at approximately the same time in human history.” He then points out another extremely interesting statistic: “Assuming Homo sapiens sapiens appeared in Africa between 200 and 150 ka, (thousand yrs ago) the period of initial domestication between 11 and 6 ka represents approximately 3% of the time modern humans have occupied the planet.” History, I might add, dating from the rise of Sumer 3000 BC, is barely 2% of the time of modern humans on Earth. After four or five millennia of such continuity the groundwork had been laid for the rise of civilization and the commencement of history and thus it blossomed in the Fertile Crescent. But it must be emphasized that what has been confirmed in the past 22 years since the publication of Sage’s paper is that the end of the Pleistocene was overwhelmingly catastrophic on multiple fronts. Whatever successful social adaptations to Pleistocene conditions may have evolved prior to terminal events, they may be difficult or even impossible to detect because of the widespread environmental destruction that accompanied the planetary shift out of the ice age into the early Holocene. For example, pervasive utilization of marine resources was a probable response to late glacial conditions, meaning that social and cultural groups would have occupied coastal areas that are now under 300 to 400 feet of ocean water. Too many modern academics in fields of ancient history and prehistory are too quick to dismiss the possibility of relatively sophisticated cultural adaptations to late ice age environments, primarily due to their failure to appreciate how profound and far reaching were the environmental changes accompanying the shift to the present interglacial period, changes that can, without exaggeration, be described as globally catastrophic. The synchronous rise in agriculture, of which Sage speaks, may be the consequence not only of the rise in CO2 levels but also the post-catastrophe reestablishment of human population to numbers sufficient to undertake agriculture on a scale capable of leaving a discernable trace in the archaeological record. As an interesting aside, in traditional and archaic traditions in which long-range time is reckoned by the changing of the astronomical ages, as marked by the passage of the vernal equinox through the constellations of the zodiacal wheel, Flenley’s period of deepest cold and severe carbon dioxide limitation from ca. 18,000 to 15,000 years before present would have occurred during the “Age of Scorpio.” Traditionally, Scorpio is the sign of death, which, somehow in this case, seems symbolically appropriate. It is entirely possible that during such a time the effort to merely survive may have been the dominant activity in which most humans were engaged. So let us now pose this question: What IS the right, perfect and optimum atmospheric carbon dioxide concentration for the global atmosphere? According to one faction, it absolutely can’t be over 350 parts-per-million, or we are doomed. That’s about what it was for a period around 1980. Prior to that, back in the 19th century, it was lower – about 280 parts-per-million, had stayed more-or-less steady at this concentration for millennia, and had not been significantly altered until humans began consuming fossil fuel. At least that interpretation is the currently accepted version of the matter. To demonstrate the stability of the atmospheric carbon pool, climatologists rely primarily on data from ice core proxies, which generally, although with some important exceptions, show roughly that concentrations remained more or less steady through time, at least over several hundred thousand years. But, it must be mentioned here, without elaboration at this time, that a number of glaciologists have challenged the accuracy of ice core data. Pointing out that there are many factors which can skew the results and that the concentration of carbon dioxide found in an ancient air bubble that was extracted from ice buried hundreds to thousands of feet down-core in the glacier and stored for thousands of years under conditions of extreme pressure, is not necessarily an accurate representation of the entire planetary average of atmospheric carbon dioxide at the time the snow originally fell in that one particular place. If it did, by chance, turn out that there were significant inaccuracies in the ice core data as to ancient atmospheric CO2 concentrations, it would render all of the elaborate computer models of the IPCC meaningless. But that is a discussion for another place. In regards to the appropriate concentration, it all depends on what time-period one is referring to. It should be pointed out that the amount of carbon dioxide in the atmosphere has been steadily declining through geological time. The work of geoscientists Mark Pagani and his colleagues have demonstrated this phenomenon. This group, affiliated with Department of Geology and Geophysics at Yale University, the Earth Sciences Department at the University of California and the Department of Geosciences at Penn State University, studied deep sea cores to ascertain ancient climate patterns. They specifically looked at sedimentary organic molecules called alkenones that are produced by certain species of algae. By studying the stable carbon isotopic compositions of these alkenones, they are able to measure the CO2 concentrations of the paleo-atmosphere. 1500 parts-per-million is almost 4 times higher than the present concentration. The following graph from Pagani et al. 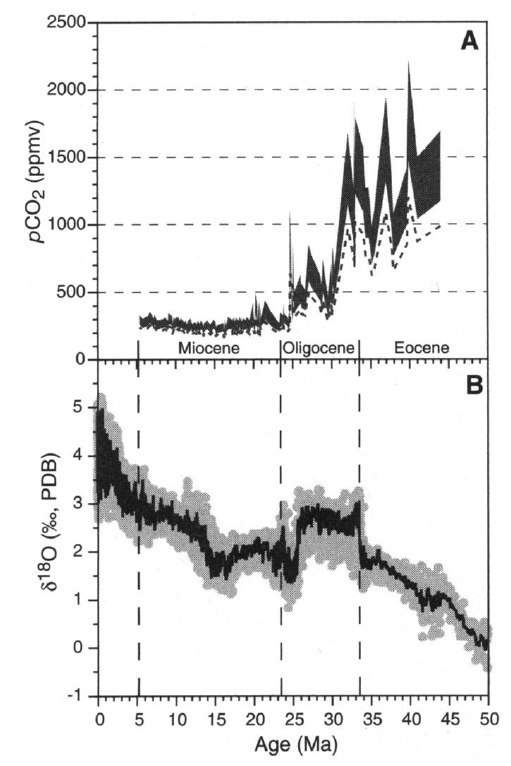 shows the trends in carbon dioxide levels up to the end of the Miocene (5.33 million years ago) and temperature from the early Eocene Epoch through to the present in the graph of oxygen isotope changes. Shifts in oxygen isotope ratios track temperature changes. These shifts can be determined by studying the composition of the shells of sea creatures – in this case benthic foraminifera. Foraminifera are a type of amoeboid protist that forms shells from calcium carbonate in the ocean water. The shells preserve the ratio of the stable isotopes of Oxygen-16 and Oxygen-18 that are present in the ocean at the time the shells form. The ratio of these isotopes preserved in the shell is dependent upon the temperature of the ocean water. When the forams die their shells become part of the sea bed and eventually part of the great masses of limestone rock found all over the world. In addition it is known that the various species of forams inhabit different temperature regimes in the ocean, so when examining sea bed cores the changes in foram species track changes in environments based upon the changing temperature of the ocean water. This property of foram species can be used to independently corroborate the temperature changes indicated by the changing O18/O16 ratio. Since the ratio of O18/O16 changes with temperature, much information about paleoclimate can be inferred by studying these changes through time. When the amount of O18 increases relative to the amount of O16, it implies a cooling of the ambient temperature. As long ago as 1953, S. Epstein, Harold C. Urey and colleagues were able to determine that an increase of 0.22% of O18 relative to O16 translated into an equivalent cooling of 1°C. (1.8°F). In the graph above from Pagani et al., one can see that the O18 has generally been increasing relative to O16, though with some interruptions, through the last 50 million years, corresponding to a progressive cooling of the global climate. One can also see that there were enormous swings in carbon dioxide and the atmospheric decline seems to have proceeded in a stepwise manner. We can clearly see near the terminal point of the oxygen isotope graph there is a major signal in the isotopic ratios correlating with the inception of glacial-interglacial cycles about 2.6 million years ago and the transition from the Pliocene to the Pleistocene Epochs. Another thing becomes apparent from studying this graph. 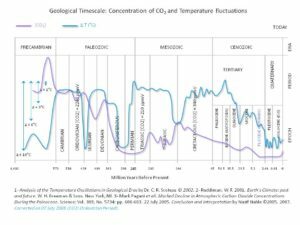 Throughout the Pleistocene Epoch on Earth – the period encompassing the past 2.6 million years of ongoing glacial ages – carbon dioxide concentrations have been at their lowest in all of Earth history since Precambrian times. Only since the end of the great ice age 11 to 12 thousand years ago did concentrations begin to rise from their depressed Pleistocene state and only within the past century have they risen to more normal amounts when looked upon within the larger context of Earth history. The information presented here inexorably leads one to surmise that the amount of carbon dioxide in the Earth’s atmosphere has been preternaturally low throughout the Pleistocene, and, that by releasing a small but significant amount into the global atmosphere, we human beings are stimulating a revival of an impaired biosphere, an impairment resulting from a planetary disruption occurring some 2.6 million years ago that initiated the cycle of increasingly erratic climatic and environmental behavior which has continued to manifest as the repetitive lurching into and out of glacial ages. Note that, once again, we have scientists observing the effects of carbon dioxide enrichment and describing it as a benefit, “an upsurge in an essential resource.” Here it is − the reality that AGW devotees and partisan factions deny − carbon dioxide is an “essential resource” and not a pollutant! Here I must make a comment to provide a context for the statement that the human impact on our planet is unprecedented. Of course it is unprecedented, unless, that is, there was a time when global human population stood at some seven billion, comparable to today, which I am not in any way suggesting. Compared to the impact of previous generations of humans on the Earth of course the impact of seven billion is going to be unprecedented. But when compared with the impacts of natural forces upon the Earth over time the imprint of humankind could prove rather ephemeral. If we consider why the human population has never been as great as the present we are lead directly to the realization that for most of the time that modern Homo sapiens sapiens has occupied this planet, the Earth has been in the grip of the brutal cold of an ice age. We know from recent history that times of global cooling have been detrimental to human population growth and times of global warming have been conducive to population expansion and social advancement. (I will have much more to say about this in another essay.) Given what we have discussed about the ineffectiveness of agriculture in a low carbon environment we can begin to understand the natural constraints imposed on human population growth. What this remark by the Green Climate Fund ignores, and that I have been opining on for years, is the reality of catastrophic NATURAL climate change that has occurred over and over and over again. Let us be clear: in the quote above from the GCF, when the website states that climate change is the defining challenge of our time, they are referring exclusively to anthropogenic climate change. There is no place in their discussion for purely natural change. And when they talk about a “united global response to climate change” they are referring to the complete control of energy from production, through distribution to consumption, with every step in the process of energy utilization heavily regulated, taxed and limited by governments, bureaucracies and self-serving political factions. Such a response system, if ever implemented, would be the ultimate tool of absolute social control and it will have little to no effect on climate change whatsoever. There is no way that, in this context, a “united global response” could mean anything other than a totalitarian system of social control, whose only effect will be to leave human civilization unprepared and unable to cope with natural climate change. In any case, the perspective one ought to derive from the entirety of this review is that the determination of what constitutes the natural, correct, appropriate, or optimum amount of carbon dioxide in the atmosphere depends upon whether you take the long view or the short view. As demonstrated, evidence suggests that at the time when huge ice sheets began to claim large swaths of the Earth’s surface, carbon dioxide levels were considerably lower than earlier times of climatic optimum when the poles were ice free, and, looking back across the paleoclimate record since that time, sometimes it appears that carbon dioxide levels and global temperature were tracking and others times not. But, before proceeding further, I must add a detail in regards to what Pagani and his colleagues referred to as “a striking climate shift across the Eocene/Oligocene boundary.” This time interval between 33 and 34 million years ago was one of tremendous global change and upheaval. 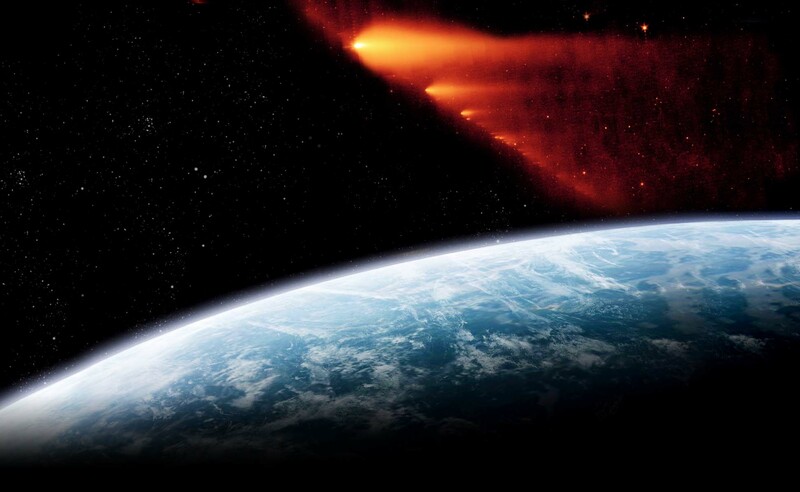 In addition to climatic changes, there were sudden and rapid mass extinctions across the boundary, vast geomorphic and biotic changes, and what is probably most significant is that there were at least two well-documented, large-scale cosmic impacts, and probably other smaller impacts, onto the Earth during this time. It may, in fact, have been a period of intensified asteroid or comet bombardment that initially triggered the “striking climate shift” and pushed the evolution of the planetary environment in a new direction, leading into “the extraordinary climate history of the Paleogene” and a steady trend toward long-term climate cooling, finally culminating in the onset of the great glacial-interglacial cycles that marked the onset of the Pleistocene Epoch 2.6 million years ago. This was the epoch which we have supposedly been out of for only the last 10,000 years. I will address the role of great impacts in the history of the Earth in another essay. For now, note that there are two massive impact craters associated with the late Eocene/early Oligocene transition – one in Siberia and one under Chesapeake Bay, USA. These “astroblemes” or “star wounds” are proof that Earth suffered a major cosmic double punch at the termination of the Eocene. Additional evidence is now overwhelming that since those times, Earth has suffered dozens to hundreds of major cosmic impacts, each of which would have had significant effects on the global environment and climate. But, of course, this phenomenon is not incorporated into IPCC climate change projections. Is Climate Change Becoming More Severe? Most climatologists are in agreement that the global climate has warmed somewhere around a degree Fahrenheit since the middle of the 19th century and the easing of the Little Ice Age. Actually the IPCC placed the warming at about .85 degrees Celsius. However, and this is a fact: one degree of warming, or even two degrees, is well within the range of natural variability, as measured over decades, through centuries and up to millennia, and there is no way of determining that the warming of the last century is not entirely natural, or if not, to what extent it is natural versus anthropogenic. It is also accepted by computer modelers working for the IPCC (Intergovernmental Panel on Climate Change) that the relatively miniscule increase of carbon dioxide in the global atmosphere by the burning of fossil fuels alone is not enough to initiate catastrophic warming, so the modelers amplify the effect by introducing positive feedbacks primarily in the form of water vapor. But the reality of such amplification is by no means certain either. In another essay I will take on the larger context of changing global temperatures through time, a perspective whose absence from the discussion precludes any meaningful comprehension of modern climate variability. The assertion that we are seeing increased severity and frequency of storms, hurricanes, inclement weather, drought, and all the other things that are now being blamed upon or linked to “climate change” (meaning anthropogenic greenhouse warming) is contradicted by proxy records – the historical record and our own direct experience of the last century. There is no evidence, for example, that the severity, intensity or frequency of hurricanes have increased commensurate with rising CO2 concentrations. Likewise with droughts, storms in general or any other extreme weather or climate events. Yet the claim is regularly made and then propagated by mainstream media, as if it was a given, that all of this is happening right now to an intensified degree and somehow the claims are never accompanied by any verifiable supporting data or evidence. (See here for a tabulation of some of the extreme environmental and climate phenomenon occurring during several centuries before significant increases in atmospheric CO2) Sea level rise over the last century, about 6 – 8 inches, has proceeded at the same pace that it did the previous century, before humans were burning fossil fuels. Glaciers have been receding rather steadily since the end of the Little Ice Age in the early to mid-19th century, again, since before humans were burning fossil fuels or contributing meaningfully to the atmospheric carbon pool. In future essays I shall examine some of these questions regarding increasing climate severity in greater depth. To bring this little treatise on the relationship between the planetary biosphere and carbon dioxide to a close, I will refer back to the work of Rogers and Dahlman, authors of Crop responses to CO2 enrichment, from which I quoted earlier. Reiterating the words of these authors, the two factors absolutely essential for proper function of vital plant processes are photosynthetic activity and water use, both which are enhanced in a carbon dioxide enriched environment, and, most importantly, as far as the human perspective is concerned, they say: “The proper function of these two vital plant processes can spell the difference between feast and famine,” – a circumstance that ought to be pondered deeply by those with a vested interest in the future. Adequate food and water are two of the most critical issues facing a large portion of the human race. With Earth’s population approaching 10 billion within two generations, an increase of 30% in the global food supply could spell the difference between prosperity and mass starvation. It should be borne in mind that famine often precedes the outbreak of widespread epidemics due to malnourishment that compromises human immune systems. Widespread hunger could be the factor that kindles the global pandemic that is so concerning to some medical professionals. To some eco-fanatics a major depopulation might be construed as a good thing. On the other hand it need not happen, and there is no doubt whatsoever that the human species can learn to live in harmony with the Earth. Is it possible that the outcome of these two strikingly different scenarios for the future might be significantly affected by the addition of a bit more carbon dioxide to the global atmosphere? Is it possible that the reclamation of regions of the planet now arid and desolate might become a reality by the addition of a bit more carbon dioxide to the global atmosphere? Is it possible that the range of Earth’s vegetation canopy has been at its geographical and ecological limit under ambient concentrations of carbon dioxide and that its range is now expanding with increased availability of CO2? Is it possible that through the release of a tiny fraction of the huge amount of stored carbon dioxide, the intensity of glacial-interglacial transitions might be ameliorated to some extent? Is it possible that the cycle of glacial ages gripping the Earth for the past ~2.6 million years has caused the accelerated siphoning and sequestration of the global atmospheric carbon dioxide budget through intensified weathering, locking away vast amounts into the ocean floor and ultimately Earth’s crust, thereby contributing to a self-perpetuating, negative feedback, amplification of global cooling? Is it possible that some factor, at this point unidentified, effected a major environmental downturn at the dawn of the Quaternary Period some 2.6 million years ago, an event from which the Earth never fully recovered, and that now, by releasing a tiny fraction of sequestered carbon dioxide, we humans are providing terrestrial nature with the remedy she requires to return to her full biological glory? These are all legitimate questions to ask, questions we must not be deterred from asking because they go against the agendas of certain political factions who, if their policies come to pass, would drive human civilization straight back into the Dark Ages. What is needed is an honest accounting of the true social cost of carbon, one that recognizes there is a direct benefit as well as a cost to increasing atmospheric carbon dioxide. What is also needed is research uncontaminated by political agendas. And, the inclusion of the study of NATURAL climate change – another 800 pound gorilla in the room – that Hermann Flohn, one of the founding fathers of modern climatology, called the Sword of Damocles suspended over the Earth. I am not here arguing that all is rosy with continued rise in atmospheric carbon dioxide. There will be negatives and limitations, as with any change or any course of action. For sure, the use of fossil fuels needs to be superseded at some point, but it has become clear that the case for imminent carbon dioxide fueled catastrophe is being overstated, and this for political and economic reasons. There are some very interesting possibilities on the horizon as far as alternatives to fossil fuel are concerned, but the irony is that to get there from here and to make the conversion is going to require a major expenditure of energy – energy available now and in the near future in the form of hydrocarbon based fuels. That is why it is critically important in the meantime that our extraction and consumption of energy from the vault of Nature be directed to the highest and best use. Here we come to what I think is the most glaringly obvious first step in getting our human act together on planet Earth: The abolition of war, which, in its preparation and execution consumes extreme amounts of energy, more in aggregate than any other human activity, and, in its aftermath, continues consuming large amounts of energy in the reconstruction and repair of destroyed infrastructure that already consumed energy in its creation, and to which must be added the wasting of human capital and destroyed lives. The abolition of war would be the ultimate environmental and social conservation measure that we humans could realize, short of protecting the Earth from the next cosmic encounter. Beyond that, conservation and prudent use of all resources are, manifestly, very good things. How ironic that the environmental movement, generally composed of partisans of the Neo-liberal left, supports a Democratic Party that has continued to encourage and promote the endless interventions and wars that squander our resources and trample on our liberties. Secondly, an unleashing of the creative, entrepreneurial, inventive spirit that was once the primary animating force of the great enterprise called America, will be the essential and indispensable prerequisite for achieving the conversion to a post-carbon future. This will come about as a natural consequence of the restoration of freedom, in spirit and in fact, freedom which is now being progressively and continuously abridged, degraded, and stifled by the disproportionate growth of political, governmental and corporate bodies that consume ever-greater amounts of our planet’s natural capital in the commission of unproductive, counterproductive, and destructive activities. And, we need debate – lots of debate. Not “the science is settled, the debate is over” cop-out of misanthropic neo-luddite eco-fanatics, or the self-serving promoters of greenhouse warming doom. These misguided individuals would, in the implementation of their agenda, render the Earth vulnerable to the next cosmic encounter that will disrupt the balance of nature far beyond the meagre influence of human beings. And if you think that this idea is far-fetched, or belongs in the realm of science fiction, well, all I can say is that you haven’t been paying attention. The scars of uncountable cosmic catastrophes are all around us, but few of us have eyes to see; the agents of these cosmic catastrophes are profusely abundant in our celestial neighborhood and are now showing themselves with disconcerting frequency. Evidence of the real threat to the environment of this planet is preserved beneath our feet and displayed over our heads – it is undeniable and it is there for all to see. But, billions of dollars are being spent every year to create the illusion that human activities are destroying the Earth and too many people are falling for the computerized smoke and mirrors and statistical sleight of hand that has transformed a precious, life-sustaining trace gas into a ghastly demon of planetary destruction that can only be subdued by totalitarian control of society and a massive wealth transfer into the hands of government and vested interests. So, in light of all of the foregoing, I am compelled to ask this question: Could it possibly be that what we have been told now for almost three decades by promoters of greenhouse doom, self-serving political and economic partisans, and fanatical environmentalists who obsess over a slight increase in a vital trace gas and believe that planetary salvation requires terminating industrial civilization is the complete opposite of the reality of the matter? On the other hand the conclusion has become unavoidable that by releasing a few hundred gigatons of the more than 100 million gigatons of carbon dioxide locked away in the rocks of this planet, we are literally stimulating a greening of the Earth along with enough gentle warming to help nudge the planet out of the Little Ice Age, results completely unanticipated at the commencement of the fossil fuel age. Meanwhile, to borrow Hermann Flohn’s metaphor, there IS a Sword of Damocles that threatens the Earth, but our fixation on this life-giving trace gas as the agent of doom diverts our attention from the cosmic beast who lurks in the great deep – the beast that our ancestors knew all too well – and whose progeny hovers just outside the range of our perception in the realm of Uoroboros.